Staying motivated is the key. I just completed my 4th week of making an effort to get back to where I was just a few years ago. It is challenging to say the least. Everyday, I pass up temptations but still feel guilty that I could've done better. I just have to keep telling myself that I am cutting a lot of bad food out and getting into better habits in general. Even if it's only a few ounces, a loss is a loss. I know I say that a lot, but hopefully I start believing it. I keep wanting bigger numbers every week, but then quickly tell myself to just be happy for not gaining. 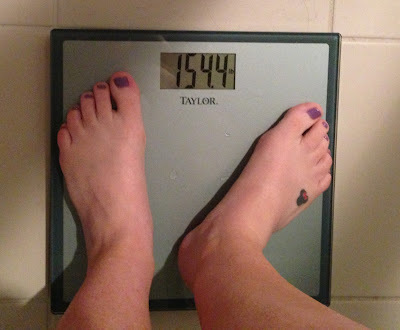 This week I lost .4lbs which brings my total weight loss to 6lbs in 4 weeks. I'm satisfied with the progress I've made so far, but I think I'll actually be happy once I get out of the 150s, then I'll really feel like I've done something! Here's to another week! Tell me know how you are doing with your goals! That's awesome that you're sticking with it! Congrats!